It is sad but true that Sri Lanka could be the only country where the politicos simply disregard the rule of law and the Constitution with a scant respect to their obligations to the people. And the way things happening in this island nation, suggests that the general public is either unconcerned or their minds are preoccupied with other stuff. In this opportunistic backdrop the corrupt politicos makes a field day exploiting everything possible within their reach. The currant Yahapalana regime elected to office in August 2015, promised the people a corrupt-free administration, which respects the rule of law. Yet, people have found those statement were meaningless and hollow. Within a short period of two years people have lost faith in the government, which has failed to realize the pledges made to the people, and hence becoming increasingly unpopular and reluctant to go before the people. In this backdrop the Provincial Council election were due for the three Provincial Councils (North Central, Sabaragamuwa and Eastern) in the month of September 2017. The government was not willing to test the people’s pulses at all and preferred to postpone the elections yet the law did not permit it. The 20th Amendment Bill was brought in to the Constitution designed to have a breathing space with a new provision proposed (Article 154DD) to conduct the Provincial Council Elections on a ‘specified date’ as determined by the Parliament, which shall not be the later than the expiration of the term of the last constituted Provincial Council, which was the Uva Provincial Council due to expire in September 2019. However, the Constitution did not permit postponing of any election beyond the specified date which tantamount to violation of the sovereign rights (franchise) of the people. When the 20A Bill was placed on the Order paper of the Parliament, many activists challenged it and the Apex Court on 08th September 2017 ruled that postponement of the election violates the sovereignty in the people (Article 3) and their rights to equal protection of the law 12(1) and also freedom of Expression of the people (14) (1). Therefore, the Court ruled that it needs people’s approval at a referendum compelling the government to abandon it. Yet, the government was not willing to face the elections and turned to adopt a different strategy. This time it relied on a Bill titled ‘Provincial Council Election Amendment’ Bill published in the Gazette on 07th July 2017, designed to increase the number of female candidates to not less than 30%. And no concerned citizen or activist did challenge the said bill, as it contained no provision that would affect any of the entrenched provisions in the Constitution. To every concerned citizen’s dismay, after the second reading of the said Bill made on 20th Sep 2017 it was transformed into a completely a different Bill at the Committee stage proceedings, which is not permitted by the Parliamentary Standing Orders. The original Bill passed at the Second Reading had been totally disregarded with a completely new set of provisions ‘smuggled in’ without following the due process established by Article 78 of the Constitution. These changes include the introduction of a delimitation committee under the new law, which would have to finish its task of carving electorates that would effectively postponed the elections for years. Already, the Chairman of the Election Commission has confirmed this fact. This wrongful act was clearly amounts to total disregard of the lawmaking process and negation of the Rule of law and the Parliamentary Standing Orders. And above all the betrayal of the trust placed in the Parliament and the Speaker by the people. The speaker should have known better that he is not entitled to ratify a Bill that requires approval of the people at a referendum, yet he had ratified the Bill. The Attorney General, on the other hand [Article 77(2)], is not empowered to express any opinion about the requirement of the approval by the people at a referendum and he is only empowered to convey his opinion to the Speaker as to whether a Bill cannot be validly passed except by a special majority prescribed by the Constitution. However, it is apparent that the Attorney General has given the go ahead to the bundle of amendments proposed to the Provincial Councils Elections Bill, which had not been published in the government gazette, enabling judicial review of their constitutionality. Thus it is evident that the Attorney General has aided and abetted the Speaker to ‘smuggle in’ some clauses, which has the effect of postponing of the Provincial Council Elections. This had been previously ruled illegal by the Supreme Court when a similar attempt was made through the 20th Amendment to the Constitution. This unlawful process adopted by the so-called Yahapalana regime is a stumbling block against the conducting of the Provincial Council Elections, which violates the people’s power of franchise, one of the sovereign rights of the people. Clearly this is an organized constitutional fraud in unfathomable scale committed against the Nation, with the knowledge of the Prime Minister, Speaker and the Attorney General. The sole purpose of this fraudulent action was none other than to postpone the provincial council election with 2/3 majority passing the Bill was to benefit the Yahapalanaya Administration that is reluctant to face elections. And unfortunately even the JVP MPs, who talks morality and their commitment to protect to democratic rights of the people, have been entangled in this drama throwing their credibility out of the window. Therefore the only remedial action available to the people is to charge every person who has been involved in this blatant betrayal of sovereign rights of the people that tantamount to the commission of offence of corruption. On behalf of the people who were robbed their sovereignty in the broad daylight, I played my part and on 04th Oct 2017 a formal complaint made to the Corruption Commission against the Speaker, the Prime Minister, the Attorney General and also against the MPs who have aided and abetted in this serious fraud committed against the people of Sri Lanka who are being mercilessly robbed of their rights for over 70 long years. Mr. Naganada Kodithuwakku: Sri lankan elections never did anything good for the country, except for the politicians of whose one group of thieves were replaced by another. I think for economical purposes, Postponing elections and conducting all at one is a good idea. I can not understand because one former CJ (he is lot of bagge in his clost and he acknowledged it). So, let them post pone elections. It uis better to propose Maithripala to fire Ranil and the gang and hire a new group. Because, UNP proves they are destroying the country and stealing from every side. We hope you won’t be a pawn of any one. Don’t count on JVP. The way they talk they are pawns of some western country. There is some discussion which says Western Intelligence organizations use Wahabis as well as communists as their pawns in the /southeast Asia. There appears to be an Independent Judiciary at present. There also appears to be freedom of speech at present. Hence what the writer has done in expressing his opinion (whether right or wrong) is refreshing and welcome. Wonder if there aren’t legal and other avenues to test the validity of the views that have been expressed here? Most Democratically elected Governments employ methods/ploys/tactics to implement its agenda put forth in its Manifesto. In the process, if they violate any laws/regulations/constitutions/rights, there should be avenues to challenge such actions..
Much needed Electoral Reforms appear to be the ultimate goal here. Such reforms are most welcome considering the state and quality of the current Local Government Administrations throughout the Country. Furthermore, the enabling Bill has been passed with a 2/3 majority with the approval of the AG. Elections to Local Bodies are expected in early 2018 under the Reformed laws, consistently applied to all Administrations. I am not in any way advocating ‘end justifies the means’. Nevertheless, if as the writer has suggested, there have been violations of Laws etc., it is indeed good to challenge them in the right Forum. Educating the Public by writings such as the above, is also to be commended. This is not so. What kind of opposition people can offer? One good alternative is for the formation of a temporary political party to face an election consisting of dedicated professionals to 1) introduce a new constitution strengthening the rights and responsibilities of the citizens 2) introducing strong code of ethics for political parties 3) ensuring that judiciary, legislature and executive are equally separated from committing any frauds or crimes. It appears Government thinks they have the right to ‘steal’ Government property or money belonging to the Government, as they are the Government, and so is their own property, and whatever you take cannot be termed ‘stealing’ as one cannot steal their own wealth! That last bit says it all. Now I cannot tell if you are simply someone who is trying to gain some political mileage out of this. I have been reading a lot of your articles lately. I do not deny that there are strong elements of corruption in this government as well. Corruption has existed and grown in all governments since independence. It is an issue that cannot be eradicated overnight and has to be dealt with systematically which is what I hope and feel that the MS and RW are trying to do. I feel this comment is really a rant against self righteous people who do not understand the political realities as they stand now and have no perspective of the bigger picture. You completely fail to mention a single good policy initiative this government has put into place. You fail to acknowledge that this government is a significant improvement to the previous one. You do not realize that tangible, permanent progress is gradual. I will not defend the wrongs of this government but no sensible person can deny that of all the established political parties, the UNP is the only one which can take the country forward as it stands. If some of the old codgers in the other parties would step aside and capable youth take their place, then perhaps the other parties too will fit in that category but that does not appear to be what is happening at the moment. A citizen frustrated with everything and everyone. ” ……. a single good policy initiative this government has put into place” Can you please elaborate on that? I know there was a lot of hype but is there any thing worth celebrating? As for ” ….. this government is a significant improvement to the previous one ..” is accepted but isn’t’ it marginal? We have the same corruption, nepotism & cronyism, not to mention, hypocrisy. The President, who has a questionable past, may not be so blatant when it comes to ignorance & corruption as his predecessor but lacks vision & integrity. RW, is perhaps, under rated but so far, he has been a great disappointment. At the end of the day, it’s the same wine in a different bottle. By the way, are you implying the country will do better under Premadasa Jnr? I won’t bet on it. I am like you, ”a citizen frustrated with everything and everyone”. Maybe Nagananda Kodituwakku is a better option if he chooses to come forward. The author has declared himself in italics as a potential SL Presidential candidate for 2020. Many readers of this forum, self included have indicated appreciation and support for that. But he has yet to declare his position on the National Question that has been bugging the country since 1948, nor stated his views about giving Buddhism the foremost position as recommended by the recent Select Committee report to the government. How long shall we wait ? You are spot on NK. After the Parliamentary election all the bloody rogues sided with MS. Elections should be held as soon as possible and that is a democratic right of the citizen. Rohingya refugee girl aged 15 raped by police personnel. What is happening to our Buddhist Philosophy? Unfortunately we are a crooked nation and there is no way that it can be resurrected with the current politicians or the previous politicians. You have my vote for 2020. 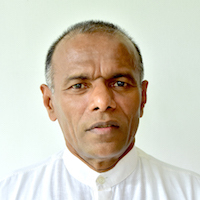 Nagananda Kodituwakku ~ “It is sad but true that Sri Lanka could be the only country where the politicos simply disregard the rule of law and the Constitution with a scant respect to their obligations to the people…………..”. This is literally true but ALL governments are in this category – some have checks and balances which are applied cunningly. Side issues are brought in to divert attention. Some governments interfere with the judiciary, most adopt the easier way by manipulating the prosecuting agency (police, AG department etc). Just before the 08 January 2015 election, MS/RW brought out some corrupt dealings of the MR regime. Lankans mandated MS/RW to bridle this bane. We now know that the new GoSL is no better but the silver lining is the realisation of the power of votes. MS/RW are telling us that MR regime was worse than the MS/RW and so choose in 2020…………..
Lankans will ditch the bloody lot and try out a government led by the likes of Nagananda. The fraudulent procedure adopted by the present regime to postpone the provincial council election indirectly can set a very harmful and deleterious precedent because if the same procedure is followed by any other regime or this regime they can bring any false bill and allow it to go through the due procedure but at the committee stage they can remove all the clauses of the first bill and introduce a new set of clauses according to the whims and fancies of the regime of the day. In this way, any government can pass a bill to postpone any election indefinitely. Things that can be done with such a constitutional coop are unthinkable and unimaginable. For instance, if a leader wants to write the country for his name, he wants only a puppet opposition like the Red-Green brothers, a puppet Speaker and a puppet Attorney General. This government may try to pass the new constitution this way. For that, they can first pass a bill to avoid a referendum and 2/3 majority using the same short-sighted procedure. Thus, for sure this procedure should be stopped and the Supreme Court should say that the so-called bill was null-and-void because the due procedure had not been followed. I to agree with Jim regarding the postponement of elections. If elections are held for the provincial councils now people will vote for the opposition as they have lost faith in the government. The outcome will be provincial councils run by the corrupt regime which was rejected earlier and the government of yahapalana continuing till 2020. The final result will be a tug of war between Government and JO, taking the country towards economic collapse. It is better to expose the corruption in the present regime and bringing the culprits to justice and force the government to tread on the correct path and steer the country towards prosperity. The Government still has time to build up the shattered economy. The lending institutions like WB, ADB, IMF and even China should be made aware that supporting corruption will not be beneficial for any party. Finally, majority of Sri Lankans are illiterate when it comes to voting at an election as they will only look for personal benefits and not at the country as a whole. BOND SCAM saga that is plaguing Sri Lanka and the future of that Nation. The order of Democracy of Parliamentary system of governances been corrupted mainly responsibility must undertaken by ruling of UNP & its politics class since 1948? SLFP has tracked into that since 1956 successes of the ruling party governances ? Both parties(UNP & SLFP) were affiliated with that politics of the similar to South Asian nations by the pattern of that politics cultures was base on family nepotism has played the key role of Party-politics and her leadership by mismanagement of democracy governances of the nation? All ruling parties bogged down with Ex-Colonial governances that by policies of “Democracy ” has turn into politically corrupted and produced incorrigible politician in members of Parliament as whole system last 45 years. The existence of Corny order of Capitalism far from national Economic development, it has been discarded overall growth and development joint hand with Neo-Liberal policies led by UNP politically corrupted leadership. While since 1977 UNP-JRJ set of policies has subordinate to neo-liberalism that surrender WHOLE national sovereignty to US led western imperialist camp. By surrendered sovereignty of nation by UNP that Western imperialism result of that People of Sri Lankan has turn into suitability of Summum Bonum of neo-colonial nation. In spite of that Our nation has come under the USA orbit control which that policies review by IMF and World Bank and foreign agencies has taken power of Sovereignty authority become Nation Policy Makers? The people’s mandate become invalid . Ongoing draft script of New constitution of Power of Devolution and surrender sovereignty was proposed by USA and UK led team of advisers.? The current UNP (New & Old)leadership of Ranil Wicks ,MS and CBK has united to agreed change two Republican Constitution — 1972 and 1978 into Federal Constitution by forcefully directives from State Department of USA? This will lead to partition of an Island for Tamil Homeland? Our sovereignty will be divided by racial basis. It created categorical rules that characteristics of anti- Sovereignty of nation’s democracy the Rule of Majority will be destroy by proposed new Federal Constitution? Ranjith Gunawardana is suffering from American phobia. US have nothing to do with the current constitution process. US might have offered advice to enact a progressive and inclusive constitution that will win the hearts and minds of ALL citizens. What Sri Lanka needs is a secular constitution guaranteeing the fundamental rights and obligations to each and every citizen? Only a secular constitution will provide equality of all citizens. When you give Buddhism foremost place, ipso facto followers of other religion will become second class citizens. As for corruption, it is endemic. All are, involved from Ministers to the peon in an office. Lately, expatriate Tamils have been visiting their relations and friends in large numbers, but they are detained and harassed as soon they land at the Katunayake air-port by Immigration officers. They tell the visit his name in the list of banned organizations and individuals. They are accused of working for the LTTE during the war years. Denial is of no avail. Then comes the subtle suggestion that he/she will be allowed to exit if they are paid a tidy sum as bribe. Some chicken hearted persons fall for the ruse, but some others opt to take the return flight. This type of bullying will not happen without the knowledge of the hierarchy. This is how corruption and bribery thrives in the paradise island.